Hi! My name´s Claudia. I come from Buenos Aires, Argentina. I am very happy to be able to share things with you all!! 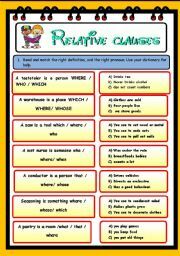 This worksheet can be used after you taught r.c., You can have a group activity, using dictionaries, challenging each group to see who gets the right answers first. Hope you like it! 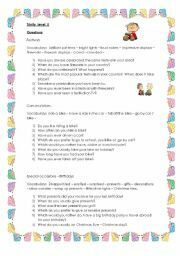 Conversation questions for the Trinity Exam level 2. 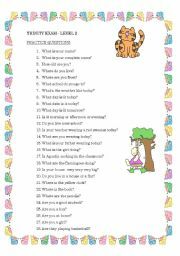 Questions include "Can", "To be", personal information, Animal descriptions, simple present questions! 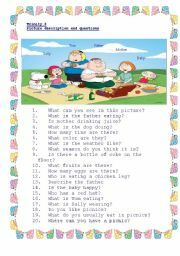 This is a set of questions based on the syllabus of Trinity level 3, this questions are similar to the ones the examiner asks students using a picture. Hope you enjoy them and find them useful. This is another paraphrasing exercise for upper intermediate students. It includes: Wish- causative have- passive voice. This is an activity for FCE students or those training for it. You will find 20 sentences to paraphrase plus key! A set of questions for those students taking the Trinity Examination level 5. This exercise is aimed at those students who are practising for the FCE. It includes paraphrasing and word formation. With Key. An activity to review passive voice in deep. Another jeopardy for beginner students. 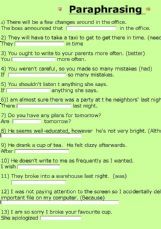 It deals with present simple, wh questions and short answers. 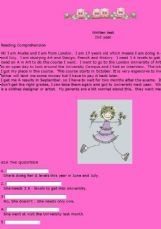 This game may be used with teens o pre teens in their second year. It revises topics at that level. Hope you like it! This game is ideal to be used after you have taught all the main topics for the pre intermediate level, such as conditionals, reported speech, passive voice, tenses! Enjoy it! A nice and simple ppt for little kids to be able to see the difference between There is and There are. Hope you like it! A nice game to review the use of indefinte pronouns. Hope you like it!!! This is a very simple game for little kids to practise IN ON UNDER BEHIND NEAR NETX TO. Hope you like it! 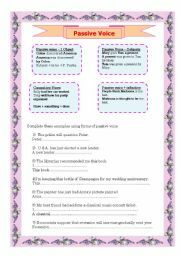 This is a very very simple multiple choice exercise for beginner students, mainly kids! 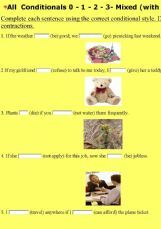 This is a simple game to revise simple past, it is very good for elementary levels spacially kids! HOpe you like it! Another Jeopardy game for Junior students! Hope you like it! An exercise to listan and fill in adjectives, nouns and verbs! A short test for students in the second year. 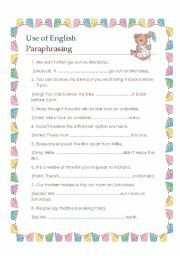 It includes tenses, some any, question making and reading comprehension. First you can ask your students to watch the video and then solve the exercise by choosing the right option! An short test for first year students to revise tenses; Simple present, Simple past, Future; Present continuous. Hope you like it and find it useful! This exercise is meant for students taking the FCE, it deals with all conditionals, mixed cases as well as other introductory words such as As long as, Unless etc. Hope you find it useful! 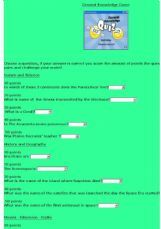 This game can be played in pairs, one students challenges the other and the winner is the one who collects more points! This is an easy exercise aimed at beginners. Good for practising listening comprehension with authentic material!